The function of the Office of Government Relations is to serve the University community in securing funding and substantive legislation which enables Hampton University to provide research, teaching, and service. This office works closely with government officials and their staffs at the federal, state, and local levels to advocate issues of importance to the university. In addition, Government Relations is the chief lobbying group for Hampton University. The office cultivates relationships with elected and appointed government officials in an effort to secure financial and legislative support. 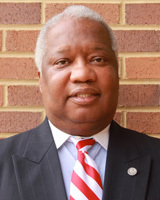 Bill Thomas is the Associate Vice President of Governmental Relations at Hampton University. Prior to this position he held positions as a Senior Vice President in commercial banking and as a consultant and economist for several private sector businesses with experience in commercial and real estate development. Mr. Thomas has significant political leadership experience in campaigns and fund raising, and economic development. Results orientated philosophy with local, state, federal and influential business and community leadership emphasizing, conservative public policy while building profitable collaborative partnerships. He has served a political advisor to Governor George Allen and former Speaker of the House Vance Wilkins. Most recently Mr. Thomas has supported development efforts at Hampton University including major biomedical enterprises and expansions of competitive government contracts award and research initiatives. Governor Bob McDonnell appointed Mr. Thomas to Virginia's Modeling and Simulation Commission where is now serves as Vice Chairman, where he has contributed to public policy development on the national and state level, including workforce development, higher education small business assistance, community development, housing, and urban core job creation via legislative initiatives. While organizing community revitalization efforts in Virginia's blighted urban neighborhoods, including creation of community development master plans, development of community-based organizations, creation of new jobs and relocation of businesses by developing legislative policy.